Like Russia and the USA at the height of the Cold War, each year IPL teams stockpile their weapons ever more aggressively. They drag around imposing players as a symbol of their might, and then leave them completely unused. Each side can pick eight overseas players in their squad, but only four in their XI. And so it has become an annual ritual to witness some of the best players in the world draped in their team bibs and smiling ruefully in the dugout - elite cricketers reduced to the world's best-paid water-carriers. There is one IPL team who make it harder to play this game. In 2019, and in the previous two seasons, Kolkata Knight Riders (KKR) had the smallest squad. This season they have selected only 21 players, of the 25 permitted, while every other side has picked at least 23. In 2018 they chose a squad with just 19 players, and even left one of their overseas slots unused; their seven overseas players selected that season is believed to be the fewest by an IPL side in history. When it comes to squad-building, KKR embrace Coke Zero, when everyone else prefers the full-calorie version. In a recent series for the Cricket Monthly, I analysed the distinct approaches different teams take to playing T20. Kolkata employ a distinct approach to running a T20 side. They eschew the conventional wisdom of packing a squad with as many players who could feature in the starting XI as possible. Instead, they select a trimmer squad and trust in continuity. More than any other side, KKR's opponents know which players they will come up against. In 2018, they used only 16 players all season; nine played at least 13 of their 16 games. In the history of the IPL, more successful teams make fewer changes after each match, while less successful sides make more, according to research from Gain Line Analytics. Chennai Super Kings, the most successful IPL team ever, make only 1.28 changes per game; Delhi Daredevils (now Capitals), the least successful of the current eight teams, make 2.22 changes per game - a difference of almost a whole extra player per game. Since 2011, Kolkata have gone from making 2.47 changes a game to just 1.575, while having a consistently trimmer squad than anyone else. More than any other side, Kolkata have attempted to make continuity a defining philosophy. In the first three years of the IPL, KKR were the worst team in the league: they came sixth, eighth and sixth, and were the sole franchise to not reach the play-offs. In eight years since, KKR have reached the play-offs six times, and won the IPL twice. Before the 2011 auction, Venky Mysore took over as KKR chief executive. Central to his vision for transforming the franchise were the greater use of analytics, and creating a more stable culture. He found they did not quite need so many players in their squad. 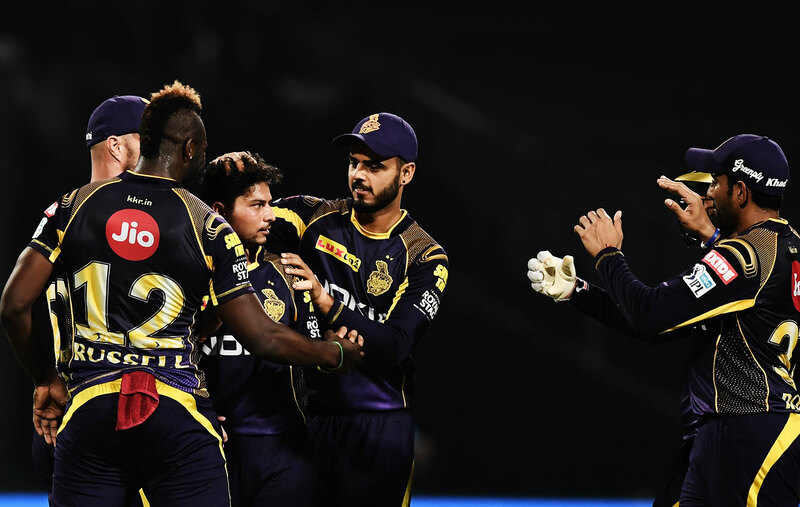 Like any team KKR needed flexibility to account for the vicissitudes of fitness and form and conditions, but they came to believe that they could manage this while maintaining a smaller squad - and that having a comparatively trim squad would bring wider benefits. Mysore explains: "What tends to happen with sheer numbers is even when we practise and have net sessions there's quite a lot of players who barely even get an opportunity to practise, because the main players who we believe are the top 14, 15, 16 are the ones where the focus is. We believe that we kind of lose those players. How do you keep them ready and motivated in case they need to jump in?" Most dressing rooms in the IPL are designed for travelling squads of 15-18 players - the more players above that number, the more players are likely to be left back at home or, if they do travel, left feeling like unwanted spare parts. A smaller squad, on the other hand, allows for greater focus on developing players, rather than merely shuffling them around. In the "big auction" in 2014, KKR recruited Kuldeep Yadav when he was an India Under-19 player; last year, they signed the India U-19 trio of Shubman Gill, Shivam Mavi and Kamlesh Nagarkoti. The idea was that younger players would encourage a model of long-term continuity. The notion of the tyranny of choice holds that while being given a little more choice is good - between two chocolate bars or two cricketers, say - too much choice - between 25 chocolate bars, or 25 cricketers - creates unwanted problems. It gets distracting, and harder to evaluate each one fairly, and it becomes tempting to focus on the weaknesses of any option. "Trop de choix tue le choix," the French say: too much choice kills the choice. With so many fine players, especially from overseas, left out of an IPL XI in every game, it is easier to overreact to a defeat and decide that those who were left out are suddenly better than those who played. Adopting such an approach creates knock-on confusion. Last season Kings XI Punjab oscillated between having two big-hitting overseas batsman in their top three - Chris Gayle and Aaron Finch - and having none, meaning that the roles played by Indian players had to be constantly rejigged. Teams who don't understand the inherent volatility of T20 can condemn themselves to never working out what their best side actually is. More so than perhaps for any other IPL squad, KKR's overseas players in 2019 have a distinct hierarchy. They have three T20 giants - Chris Lynn, Andre Russell and Sunil Narine - who can expect to play in every game if they are fit (all three played each game in 2018). The first two of these players also have clear replacements - Joe Denly, who fulfils Lynn's role as an aggressive opener; and Carlos Brathwaite, who mimics Russell's all-round role. KKR's final overseas spot will probably be taken by the quick bowler Lockie Ferguson; the alternatives are England's left-armer Harry Gurney and South Africa's Anrich Nortje - a rapid bowler bought for only Rs 20 lakh, a player with a high potential upside. The upshot is that, unless injury keeps out Narine - who, as an elite spinner and an opening batsman beginning his innings at an extraordinary tempo, is a unique cricketer - KKR can accommodate any injury to an overseas player with a like-for-like replacement. They seek to minimise disruption, such as from this year's World Cup. Several countries - notably Australia and England - will recall their World Cup players before the final stages of the IPL, meaning that some franchises will be depleted. Rajasthan Royals will lose three, or even four, probable first-choice players - England's Jos Buttler, Ben Stokes and perhaps Jofra Archer, as well as Australia's Steven Smith - prior to the final stages. Barring perhaps Denly, all of Kolkata's overseas players should be available for the entire tournament. Indeed, one reason why KKR pursued Ferguson was because they knew all New Zealand players would be able to play the whole season. "Playing together with the same group of people for a long time makes you better. It just does," said Bob Myers, the general manager of the Golden State Warriors in 2014. Golden State won three of the next four NBA Championships. Continuity tends to encourage selfless cricket. T20 is a game in which, for even the best batsmen, failure is inescapable. Where players are fearful of being dropped - compounded in the IPL, because an overseas player's salary is directly linked to the number of games they play - this insecurity can create perverse incentives. A top-order batsman fretting about being dropped may, consciously or unconsciously, be cautious for a few more balls early in his innings. Sometimes the interests of the player and team can collide. With a stable XI, says AR Srikkanth, the KKR analyst, "players can play freely, play their natural game and according to the situation." This liberating spirit is especially important for Kolkata, who have been at the vanguard of the thinking that wickets in T20 have historically been overvalued, and players should generally be more aggressive earlier in their innings. Mysore hopes that the IPL will move away from one of the biggest roadblocks to team continuity: the auction. "I'd like to see a different system perhaps - maybe a mini-draft, more trading and loans, rather than a full-scale auction where you undergo significant churn of the team. We have to get to that next phase now, I think." In the very first IPL, Rajasthan Royals were mocked after only spending $3.6 million, when all other teams were at or near the $5 million salary cap. Yet, they identified four core overseas players who would be available for the whole tournament - Shane Warne, Shane Watson, Graeme Smith and Sohail Tanvir. They selected the quartet in nearly every game and won the tournament. Partly, this was a victory for continuity. So was Chennai's astounding run of success - reaching five IPL finals in six years from 2008-14. Their success was underpinned by using the same core of players from game to game (although the overseas players would often change from year to year), with flexibility in the middle order. Gain Line Analytics has analysed the traits of successful sports teams and found that, when accounting for talent levels, sides with lower player turnover tend to be more successful, especially in high-pressure games. Tottenham Hotspur didn't buy a single new player before the start of the 2018-19 season. Yet, despite having only the sixth largest revenue and wage bill in the Premier League, they are currently third - following on from being third, second and third in the previous three years. They have found a way to perform beyond their budget. Analysing T20 cricket, Gain Line has found that teams who change their sides less become more likely to win and enjoy sustained success. The company has developed a metric for in-game cohesion, which measures the amount of times players have played together. Over the 11-year history of the IPL, it finds that, where there is little correlation between success and the number of games played by players individually, the more cohesion a team has, as measured by their games played together and stability of the side, the more successful they generally are. This suggests that teams should be keen on signing players who are used to playing together, and working in tandem with the bat and ball. "Cohesion isn't just about what happens in one specific team but is a function of all the relationships the players have - from the IPL to international cricket and other T20 leagues," explains Simon Strachan of Gain Line. "A strength of successful teams is that they don't 'blink' and are far less reactive," Strachan says. "All the evidence we find across team sport is that churn - whether long- or short-term - impacts performance." Across T20 leagues, teams in the top two use one fewer player a season than those who don't qualify, Dan Weston from Sports Analytics Advantage has shown. He surmises that the original envisaged "first XI" is likelier to be of higher quality than envisaged bench players - the first XI were selected earlier in the auction, after all - so there is often a steep drop-off in quality when teams reach deeper into their squads. From 2015-17 in the IPL, CricViz found, sides that used eight overseas players in three or more games over a season won only 39% of matches. This suggests that it is not just that winning teams have less reason to change their sides. Teams who change their sides less also become more likely to win. In 2015, Surrey signed Wahab Riaz for two T20s in consecutive days; the gap between the start of his first game and end of his second was barely 24 hours. Riaz recorded figures of 2 for 70 across eight overs in the two matches. That season, Surrey finished seventh out of nine teams in their T20 Blast group. It was another snapshot into the tyranny of choice, and the perils of teams trying to plug any short-term hole in their side with a glitzy recruit. In the IPL - and, to a lesser extent, the Big Bash and the Pakistan Super League - the calibre of overseas players is high enough that it is almost always worth having the full quota. But in other leagues, filling a team with foreign recruits is fool's gold. Paradoxically, in many T20 leagues the more overseas players you have, the more likely you are to lose. In the Caribbean Premier League, teams with five overseas players in the XI, the maximum permitted, only win 45% of their games, fewer than those with four overseas players, who win 50%, or those with three, who win 56%, according to Joe Harris of White Ball Analytics. Similarly, in England, sides that field two overseas players perform worse than those that field one - perhaps because the second overseas player often, like Wahab, flies out almost before he has checked in. Having more overseas players also doesn't correlate with winning more in New Zealand and South Africa, Harris finds. "In these leagues, an overseas star probably comes with an inflated price tag that could be better spent on locals who understand the conditions better," Harris says. It is a window into a broader truth. For all the dizzying array of options that T20 franchises have, sometimes the best signing can be no one at all.